POW opens it doors on the 3rd December with The Fiesta Resistance, a Central American street art showdown!! The event will feature a full set by the Date Farmers, Saner and Smithe live from Mexico City. There will be lots of new POW prints released, adult Pinatas, plam trees and mescal. The Fiesta will run until the 23rd december. To kick start the Fiesta and give us an idea of what to expect, POW have released a print from The Date Farmers. The Dont Fight Back print released today is a six colour screen print on archival paper and has been produced in conjunction with New Image Art. Three Colorways in Edition of 120 at just £145 each. 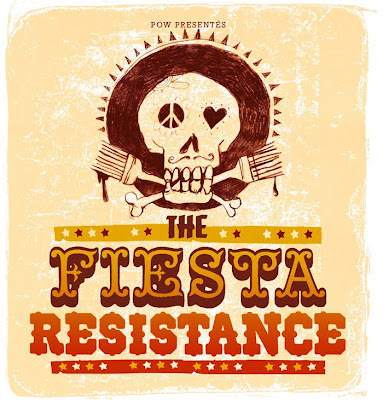 Check POW's website for Fiesta times and directions to their new space close to Aldgate East Tube Station.